Three watercolour paintings attributed to the former German Nazi leader Adolf Hitler are being auctioned in Berlin. 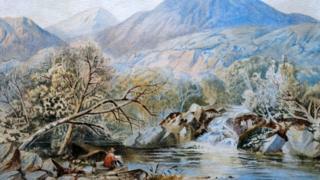 The separate works depict a mountain scene, a river and a distant figure sat beneath a tree. The watercolours were created in the early 20th Century while Hitler, later guilty of some of the worst crimes in history, worked as a painter in Munich. Auctioneers said that while they had "no artistic value", the pictures could sell for thousands of euros. Strong demand is expected from online bidders in the UK, Scandinavia, the US and Russia. Image caption Auctioneers said that the works held "no artistic value"
"If you walk down the Seine and see 100 artists, 80 will be better than this," Heinz-Joachim Maeder, a spokesperson for the Kloss auction house in Berlin, told Reuters. Before World War One, in which he fought, Hitler worked in Vienna as a casual labourer and an artist, drawing postcards and paintings. In Germany, it is legal to sell pictures by Hitler so long as they do not contain Nazi symbols.